Friday, November 1st was a very sad day for many of us in the papercrafting world. It was the day that Cath said goodbye to the Moxie Fab World. As I read the words, written as only Cath could, I was shocked and saddened, as I can't imagine the crafting world without Cath! She has brought so much to the crafting community and inspired so many of us each and every day! Today, November 9th, is a good day. Today we are celebrating Cath in the most epic of all blog hops EVER, over 270 paper crafters in total. You should have arrived at my blog from Courtney Kelley. If not, you can head on over to the beginning of the hop here, at the Moxie Fab World! One of my favorite things about the Moxie Fab World was the Countdown weeks when new Special Issues were releasing. If you follow my blog you know that I liked to challenge myself on "Moxie Fab Missions". I looked through some of her past countdown challenges and made this card inspired by the Card Creations Week: The Chevron Challenge. This card is for you Cath, because YOU are simply amazing! I hope to see you around because it just wouldn't be the same here without you! Thank you for the love, support & encouragement you have given me and the hundreds of others like me over the years. Enjoy this special day that is all about YOU!!! Your next stop is Alice Golden. beautiful card, Maureen. love the layers and dimension. A classic Maureen card...I adore it and Cath is sure to be in LOVE with it! What a beautiful card Maureen! Cath will love it! This is so pretty! I love the combination of the roses with the chevron. So pretty, such a clean design, love all the white space! Beautiful card...just as beautiful as Cath...I am sure she will love it! This is such a lovely card Maureen! I love the chevron texture! Oooohhh. A card after my own heart. Those colors. Those blooms. And then white on white chevrons. Oh, and not to forget that fabby WPlus9 sentiment. She's gonna love it. So pretty - I love it... stunning. so sweet and elegant! such a gorgeous card! 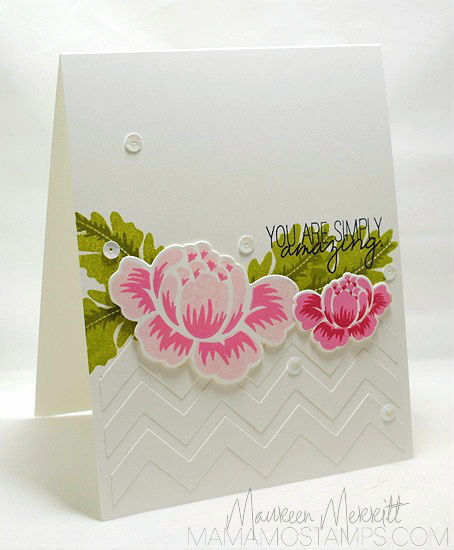 This card is simply amazing, Maureen! I love it!